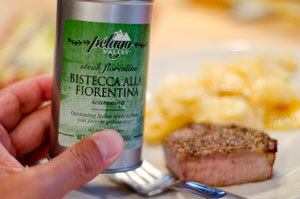 I’ve reviewed some Pelago Valley products in the past, but wanted to mention their Steak Florentine seasoning. With spring finally here at last, I powered up the barbeque and put on some steaks. I hit them with some olive oil and the Pelago Valley Bistecca Alla Fiorentina spice. The steaks turned out fantastic with a nice original taste which wasn’t too much. The spices enhanced the meat and provided a very nice meal. Can’t wait to use this one again.